It's Fall and all is well, now comes the question, Sweet Potato or Pumpkin Pie? The polls seem to always lean towards the sweet potato, leaving poor pumpkins to sit idly by, watching the party from the sidelines.... Not anymore! This recipe quickly became popular with my family. 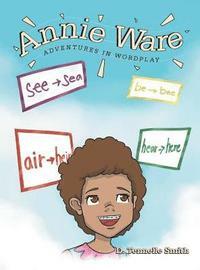 As picky as some children are, even my nephew Braelyn and daughter Genesis loved it! I am particularly proud of my 'baby' too. For a while, I considered saving this recipe for my private archives and for special family affairs, but I finally figured a recipe like this should be enjoyed by all. The pumpkin for this recipe was hand picked by me and roasted off in a 400* oven. The recipe from there on, is relatively easy and makes two deep dish, 9 inch pies. 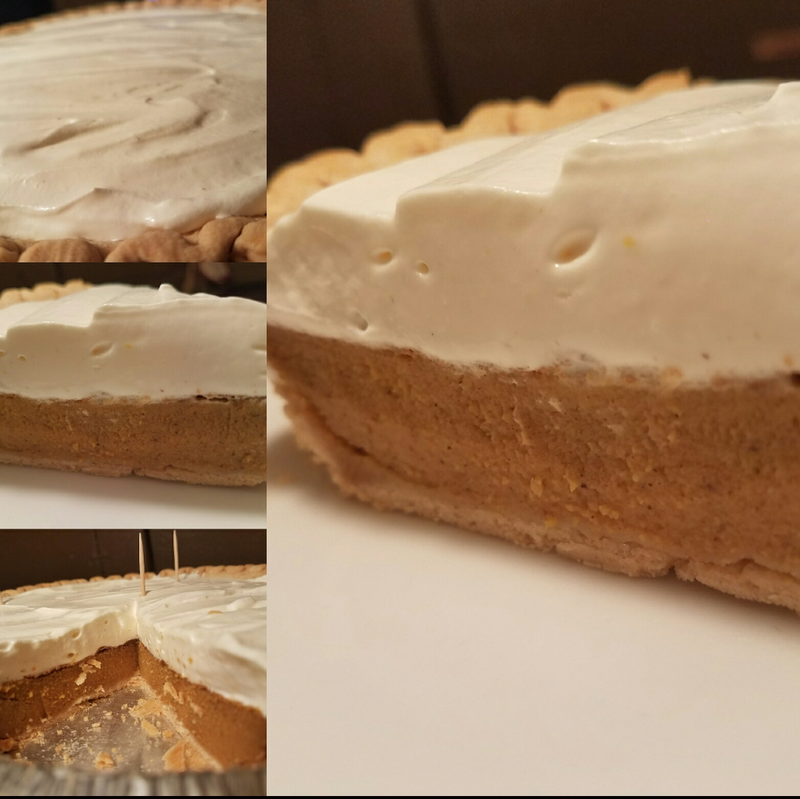 I created this recipe with more than just a dollop of cream on top, as I felt like the best part of a pumpkin pie was a bit the whipped cream mixed with the bite of pie. At least until now! The cream of this pie is a combination of flavors, warm, tangy, not too sweet and harmonious with the spices of the pie. 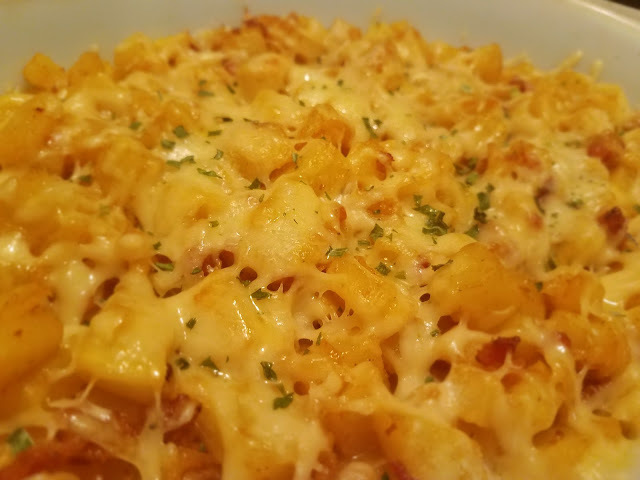 I actually came up with the topping for another recipe of mine, and loved it so much, I wanted to find other places that it would work well. I hope your family enjoys this recipe as much as mine does. I feel good about the prospect of someone outside of my normal circle of friends and family appreciating something that I created and quite literally, tasting my passion for cooking, on a plate! Get ready to change your whole opinion about Pumpkin Pie!! Fresh Pumpkin is cut into equal parts, drizzled with a little light tasting oil, and sprinkled with a scant amount of kosher salt. Roast uncovered in a 400* oven until soft, about 30 minutes. Allow pumpkin to cool slightly. Cut or peel rind away from pumpkin meat and the roasted pumpkin is ready to use. Mix spices together in a small bowl or in the mortar, pour contents into pumpkin blend. Place all of ingredients into bowl and blend until smooth, about 2 minutes. Pour equal amounts into pie crusts. Bake on baking sheet for about 40 minutes, or until toothpick inserted, comes out clean. If the edges of the pies brown too quickly, cover with foil for the remaining baking time. Remove from oven to cool for 1 hour before placing in the refrigerator to cool an additional 1/2 hour. In a medium bowl, combine the sour cream, confectioner's sugar and salt. Once blended, add whipped cream. Zest the lemon atop whipped cream. Grate a scant amount of nutmeg atop also. In a FOLDING fashion, combine the sour cream mixture with the whipped cream mixture. Place in refrigerator while pies cook and cool. After pies have cooled for at least 1 hour and a half, divide the Cream topping and spread evenly atop pies. Add toothpicks if desired to keep plastic wrap from sticking to top. Chill for at least another 1 1/2 to 2 hours for best slicing results. Makes 2- 9 inch pies. *If you are unable to freshly grind above spices, store bought Pumpkin Pie Spice will substitute. Also, plain canned pumpkin can be substituted for fresh roasted. ***Lighten the recipe by using one or more of the following; fat free evaporated milk, light sour cream and egg substitute!! 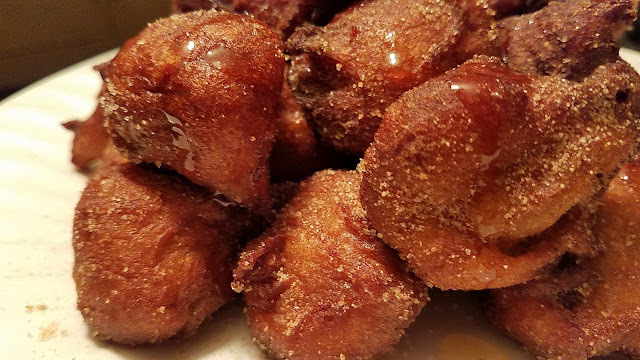 This recipe is an original and family favorite. 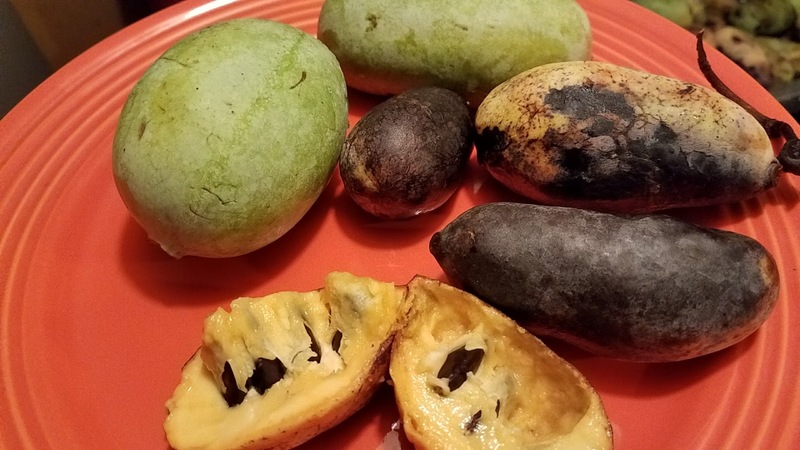 I came up with the initial recipe several years ago, but I have made some minor adjustments, though still retaining it's allure and harmony with the palate. I enjoy the simplicity of the dish, along with the complex flavor profile that is presented, when combining items from one or more cuisines to make one mellifluous meal. I used a Thai ingredient call to complement an Italian pasta, any will do, Penne and Penne Rigate are two of my favorites for this. Fettuccine also works well. After the initial prep and marination time, this will come together quickly. It even tastes amazing at room temperature. I prefer to grill the chicken over hot coals, but it is not necessary. A grill pan serves well for depth in flavor and for aesthetics. This is soon to be one of your family's favorite dishes too! The ingredient call sounds scary if unfamiliar with Thai cooking, but please trust, the proof is in the final product. This photo is my recipe served family or buffet style, but feel free to mix the chicken in with the pasta and broccoli for no-fuss serving, or arrange the chicken sliced atop or whole pieces along side the pasta/broccoli for even more exciting plating adventures! Place in a resealable bag, 2 tbsp. fish sauce, juice of 1 lime,1 tbsp. cilantro leaves, half of garlic and a heavy drizzle of olive oil. Shake bag around to blend. Press out excess air and marinate for 15 minutes to 1 hour. Meanwhile, cook pasta according to package instructions in salted water, stopping a little short of al dente, adding the broccoli during the last two minutes of about 7 minutes. Drain and rinse the pasta and broccoli briefly in cool water to slow the cooking process. Set aside. Grill or sear the chicken until no longer pink, set aside to rest several minutes before slicing. Meanwhile, in a large saucepan, over medium heat, melt butter along with a small drizzle of olive oil. Add remaining garlic, 1/2 green onions, and sambal oelek. Cook for several minutes until fragrant, stirring often. Add coconut milk, lemongrass paste, juice of second lime and fish sauce. Turn to medium high and bring up to a boil. Check seasonings, adjust according to taste. Reduce to heat to medium and add pasta broccoli blend. Add remaining cilantro and green onions. Fold pasta/broccoli blend into coconut milk until heated through and the liquid is absorbed. 1. Fold in the chicken to serve as an all-in-one meal or family style. 2.Leave the chicken cutlets whole and serve along side pasta. 3. 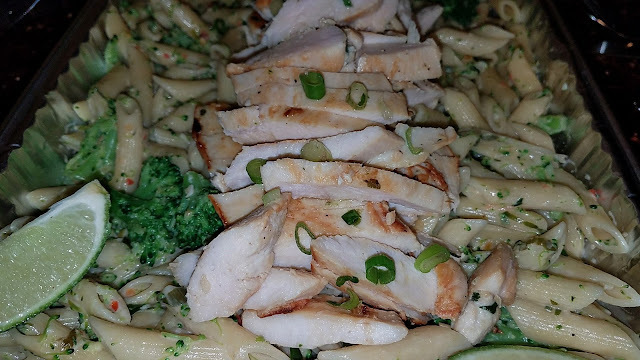 Slice the chicken and serve atop the pasta/broccoli blend. 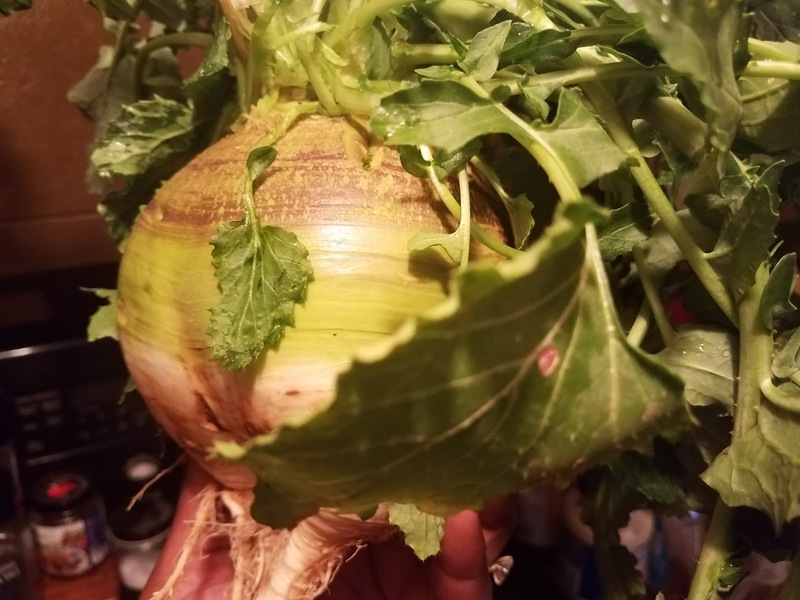 Garnish with cilantro leaves, sliced green onion tops and lime wedges, if desired. Spaghetti and Lasagna are two of America's favorite recipes to create at home and order out. What do you get when you combine the two? 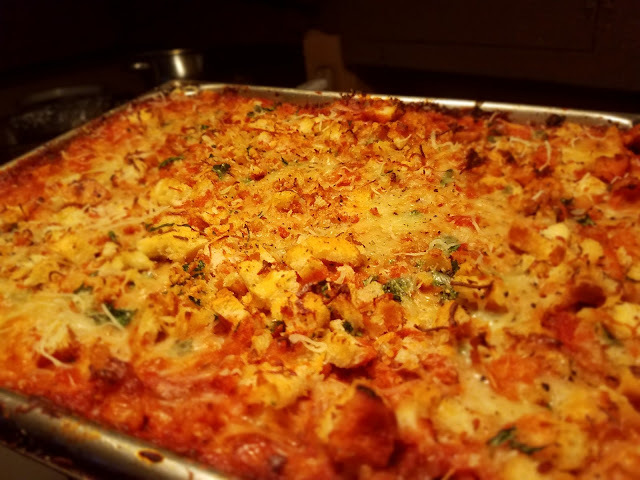 This wonderful and family friendly recipe I created called Spasagna. 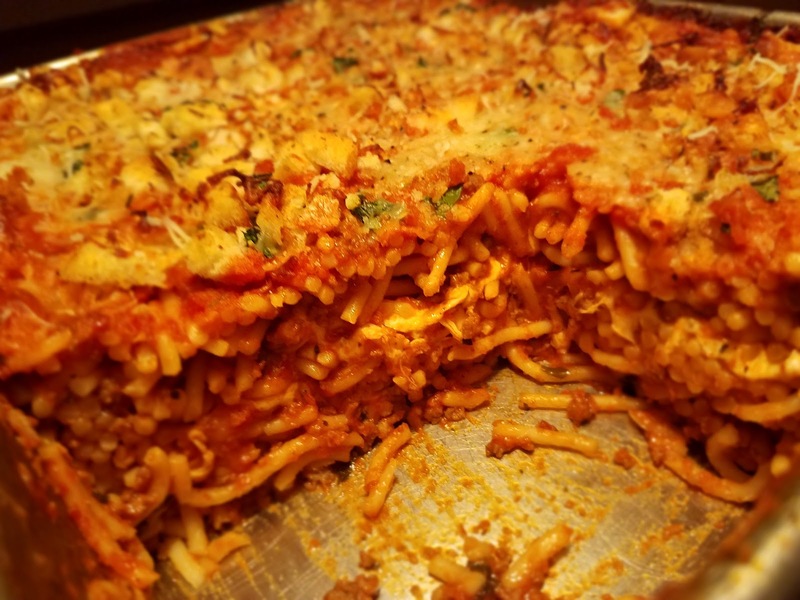 This is simply your favorite recipe for spaghetti, layered with mozzarella like lasagna and finished with a garlicky and cheesy topping consisting of store bought garlic bread pulverized into tiny pieces, tossed with shredded Parmesan and mozzarella cheeses, fresh parsley and olive oil, smothering the whole shebang and baked. This topping rocks and helps to lend to a one dish meal, cutting the carbs by using the garlic bread as a garnish of sorts as opposed to a side item. Everything in this recipe is essentially cooked already, so it is basically heating the Spasagna through to melt the wonderful sheet of mozzarella in the center. I discovered this sheet of fresh mozzarella put out by BelGioioso, that unrolls as would a sheet of paper. It is fun and easy to use, the price around 6 dollars per 8 oz, I however caught mine on sale. If you cannot find this in the deli section of your grocer, simply get the ball of mozzarella or burrata and slice thinly and layer accordingly. 2-23 oz. jars of your favorite spaghetti sauce or homemade, preferably one chunky, one regular, reserving 2/3 cup for the top. Combine the spaghetti ingredients down to the palmful of of herbs, sugar to taste if desired. Drizzle baking dish with olive oil or spray with cooking spray and place half of the spaghetti mixture in dish. Unroll the mozzarella cheese and place it on top of the spaghetti. Spread reserved sauce over spaghetti. Top with parsley garlic bread-bread crumbs and cheese mixture. Cover tightly with foil and bake for about 35 minute,or until dish is hot throughout and bubbly. Remove foil and bake for another 5 to 7 minutes, or until lightly browned. Let dish rest for several minutes before serving. Last summer, I could proudly say that I had consumed more fish during those several months, than I had for the whole year; perhaps as much as two. I have a family of recreational fishermen, including a brother in law, whose proclamation is that of an "Angler". He is quite efficient I might add, an avid hunter as well, who affords me the wonderful wild game by seasons from squirrels to wild turkeys to venison, plus volumes of striped bass and catfish with heads the size of small children, yeah he's good. Another brother in law favors striped bass, wall eyed bass and perch. On any given day off during the summer, he would set out mid morning or evening to bring back the catch of the day. During last summer, my sister Gayle and I would clean anywhere from 25 to 50 fish collectively, maybe two or three times throughout the weekend; scaling, butterflying and soaking, frying some fresh and bagging and freezing piles for later. I like to consider days like that live labs of sorts, helping me hone my skills and efficiency, making me a stronger chef . I try my hand at fishing, licensed and all , but I haven't reeled any in yet! I even accompanied the guys on some of the bait runs. We meet up with another avid fisherman, usually late night or early morning because of how the dams and bait run, who travels extensively for the ritual of catching the infamous 'shiner' or"'LY's" which are a small and plentiful bait fish, found also in schools and near rocks at the dams and lakes. Larger fish called shad are also a part of the haul, but aren't as sought after as the smaller previously mentioned bait, but finds itself in the throw nets. When meeting with the bait-man, he pulls out a large cooler. Upon opening the lid, he reveals hundreds of these small and fresh beauties, glistening with ice, lustrous, all their tiny eyes are clear and they smell fresh, not fishy! I was stoked and reminded of the photos of fishermen from other countries and their baskets or small boats of fresh fish, on their way to market, home or both. I was reminded of the sardine and other fishes feasted upon regularly in Italy and the Mediterranean, or packed in salt and dried along the African Coasts. I wanted to see if they were as palatable as the similar ones I'd seen. I wanted to see why we weren't eating those too! The fishermen chuckled when I said, I want some to take back home to the lab, that being my kitchen. I was inspired instantly and set to work. The above photos illustrate what I did with the larger shad, about 4 or 5 inches long. 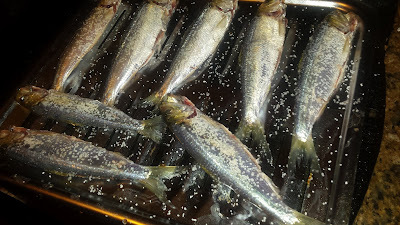 I scaled and gutted them all, rinsed and sprinkled them with kosher salt. I placed them in a 200 degree convection oven for around 6 hours, until they were completely dry. I let the fish cool out in the open for about 1 hour. 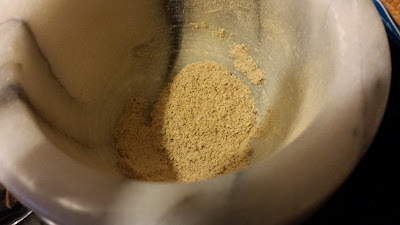 I then broke the fish up into manageable pieces and used my mortar and pestle to turn the whole fish into a powder. I mixed the powder with a mug of hot water and drank it. I also added it to my Ramen bowls. I finally had a lasting fish stock on hand, and it's shelf life was extended considerably! I keep the fish whole in a zip lock type bag, and pulverize when I need them. 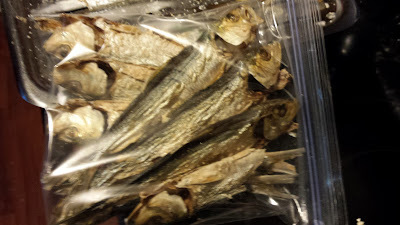 I dried these fish last summer and they are still wonderfully intact and I get to drink a whole fish anytime and reap the benefits of the whole thing, wasting none and loving the copious amounts of goodness it is for my mind, body and soul. Oh, the fishermen were amazed at what I came up with, they added some credits to my resourcefulness, and were reminded of yet another reason I was good to have around!